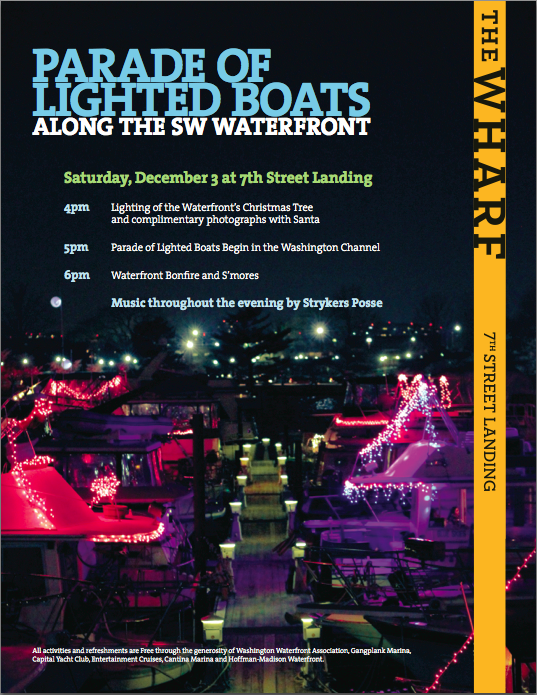 Gangplank Slipholders Association (GPSA): Parade of Lighted Boats Dec 3 at 4PM! Parade of Lighted Boats Dec 3 at 4PM! Mark your calendars for DC's only maritime holiday festival! This Dec. 3 programming will begin at 7th Street Landing starting at 4PM (Lighting of the Southwest Waterfront's Holiday Tree and free photos with Santa). The Parade of Lighted Boats will begin at 5PM. In addition, Gangplank Marina slipholders will compete for the best in slip lighted boat this year. You'll have an amazing view of all of the action from 7th St Landing. As the parade concludes, the party will continue at 7th St Landing with a waterfront bonfire and free s'mores!